While it’s true that modern business communications technology enables us to work from anywhere, it’s also true that not all “anywheres” are created equal. 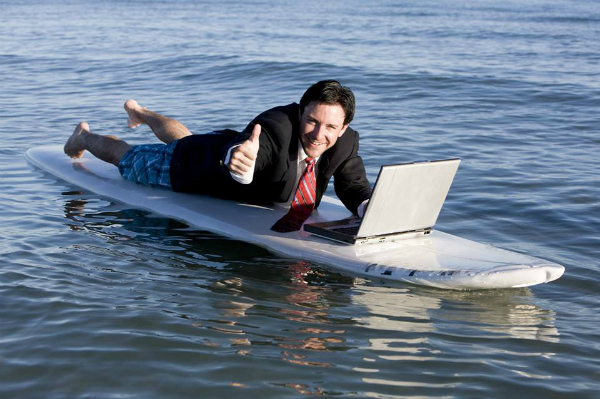 All of those aspirational photographs of people working from the beach are beautiful until you think about getting sand in your laptop, squinting into the sun, or trying to talk above the rush of the waves. 1. Co-working spaces have all of the perks of the office without all of the distractions (or, at least they have different distractions). One of the main benefits of working from anywhere is that burst of mental energy you get from new people and places. Co-workings spaces can give you that little lift without making a big change to your work habits. 2. Public transportation isn’t just about getting you from here to there. You can use planes, trains, buses and ferries to get a jump on your day or finish up last minute tasks on your way home. I know it sounds crazy, but you may actually enjoy your long commute. 3. Dog parks – I’ve talked about bringing dogs into the workplace, but I’ve also witnessed more and more people bringing their workplace to the dogs. And, to be honest, dog parks can be a great place to get stuff done. Set yourself up at a picnic table and get down to business while Fido, uh, does his business. 4. Airports – Blogger Stephanie Reed detailed the best airports to work from, but as long as you have internet and power, any airport is a great place to turn a long delay into a productive work day. 5. Cars – Now I’m obviously not saying you should work while driving, but so many people use their car as a mobile office that a simple Google search will turn up hundreds of tips and gadgets to make your car ready for business. 6. Service centers – So what do you do when that mobile office is in the shop? You may be in luck, because more and more service centers have turned their waiting rooms into office spaces. You don’t mind waiting for an oil change when you can do so from the comfort of your own mini-cubicle. Call me weird, but I actually look forward to bringing my car in to my dealer’s service center precisely because of the free Wi-Fi, bright space, and plentiful snacks. 7. Libraries – If you haven’t been to your local library lately, you’re probably in for a shock. Today’s libraries aren’t about dusty books and the Dewey Decimal System. Modern libraries are home to sleek meeting spaces, 3-D printers, and free Wi-Fi for the decaffeinated crowd. 8. Coffee shops – If you’re like me and you not only do need caffeine but you’re also one of the unshushables, then working from “anywhere” will inevitably mean working from a coffee shop. So many people work from coffee shops that typical Yelp reviews categorize coffee shops by how they deliver the three essentials of remote working: free Wi-Fi, outlets, and coffee. Seriously, sometimes it’s just about the coffee. 9. Up north – Here in Wisconsin, the cabin is almost always “up north”. Even if you live in northern Wisconsin, there will still be someone you know who has a place “up north”. (Eventually “up north” reaches the North Pole. I don’t know what happens then.) In other parts of the country, people go “south” or “downstate” or “to the Hamptons” to get away from it all. As an aside, if you go to the Hamptons, meet me in Montauk? Anyway, the truth is that we really don’t want to get away from everything. Cabins, cottages, resorts and vacation rentals are almost all equipped so that you can easily mix in a little bit of work with your play. 10. Home – It’s hard to beat the convenience of home. For every distraction (needy dogs), there’s an amenity (full fridge!). We’ve detailed many of the benefits of working from home, as well as the requirements (ahem, pants…), but at the end of the day, there’s no place like home! So what’s your go-to anywhere? Host an idea swap! Here’s how!